The Fábrica Militar de Aviones (FMA) located in Córdoba was founded in 1927 and has produced over 1,300 aircraft of 30 different types. The FMA was a manufacturing center belonging to the Argenitine Air Force [FAA]. The Aircraft Factory of Córdoba was the first in Latin America. In the middle of the 20th century it became a formidable pole of industrial development that eventually produced, among others, one of the first military jets: the Pulqui I. This experience was the basis for the development of Pulqui II, exceptional hunting aircraft, the fastest in the world. Founded at the dawn of aviation, in 1927, the then Military Aircraft Factory built the first 3 aircraft under European licenses, but in 1931, under the direction of Ing. Military Bartolome de la Colina, designed and built the first national plane, Ae.C.1, whose success triggered a family of Argentine aeronautical products until the end of the decade, since in 1939 and 1940 were manufactured under license FW biplane Curtiss Hawk 44J and 75 respectively. Series production of I.Ae.22 "DL" was framed in the First Five-Year Plan, allowed the FMA outsource the manufacture of many of its components to private companies, thus generating the birth of some 107 factories and workshops, then they come to more than 300. The Airman Institute (as the factory was called from 1943) oversaw the transfer of technologies by providing technical advice and financial support when necessary. This laid the foundation for the industry that would allow later installation of the first automotive Córdoba terminals Argentina (Fiat in 1954 and Industrias Kaiser Argentina -IKA-). Following Germany's defeat in World War II, Kurt Tank, the Focke-Wulf chief engineer and the designer of such famous airplanes as the Focke-Wulf Fw-190 fighter, restarted his professional life in Latin America. The Argentinean Government offered him the opportunity to work at the Fábrica Militar de Aviones (FMA - Military Airplane Factory) in Córdoba, at the time known as the Instituto Aerotécnico, (Aerotechnical Institute). Kurt Tank, along with many others who had worked with him at Focke-Wulf, moved to Cordoba in 1947. On 9 August 1947, an Argentine jet prototype known as IA-27 Pulqui I flew for the first time -- the fruit of an idea developed by a French-Argentine group headed by the engineer Emile Dewoitine and assisted by Argentine engineers Ignacio San Martin and Norberto Morcchio, who were working at the Fábrica Militar de Aviones. With the Pulqui in the Cordovan sky, the Argentine aeronautics industry gave a gigantic jump and Argentina became the fifth country in making a jet plane. First there was the German Heinkel He-178, inaugurated the 27 of August of 1939); soon they followed the Briton Gloster E.28/39 (15 of May of 1941), the American Bell P-59 "Aircomet" (30 of September of 1942) and the Soviet Mig-9 "Fargo" (26 April 1946). On 27 June 1950, the IA-33 Pulqui II, a second Argentine jet prototype, made its maiden flight. This aircraft was the product of similar engineering teamwork, in this case led by the German engineer Kurt Tank. The Pulqui II was a completely metallic aircraft, powered by a Rolls-Royce Nene II with 2315 kg (5100 pounds) of thrust. Its wings had a 40º swept angle, and it was able to reach a maximum speed of 652 miles per hour. However, neither of these two models was ever manufactured in mass production. This omission frustrated a great hope to make the country reach a higher technological level. After the inauguration of Chief Engineer Juan Ignacio San Martin as Director of the company, the factory produced a leap that led her to take more than nine thousand people in an industrial complex that from the creation of IAME (Industrias Aircraft Mechanical and State) in 1952, not only built aircraft, engines, propellers and accessories, but also utility vehicles, cars, tractors and motorcycles. The DL 22 plane, national design, the product was "driver" of this important growth by fabricating two sets of 100 each aircraft. It notes that the aircraft was equipped with the engine "gaucho" which was also manufactured in Cordoba. Notably, between 1940 and 1955 only national developments were built, the plant did not manufacture any aircraft under license. The fall from power in 1955 of Juan Peron as President meant the interruption in the development of new aircraft at the Cordoba Factory. From the Revolution of 1955, a sudden change in plans factory and turns back to interject with its own production of licensed production (aircraft T-34 Mentor, Morane Saulnier MS 760 Paris, Cessna). Most of the engineers composing Kurt Tank's team left Argentina, and Kurt Tank himself settled in India, working for the Hindustan Aeronautics Limited (HAL) developing the HF-24 Marut supersonic fighter. The Argentine Ministry of Defense also signed the first five-year contract for the maintenance, modification and modernization of the Air Force fleet in 1995. This contract was followed by a second one, signed in July 2000 which, besides the maintenance of Air Force aircraft, included the manufacture of 12 AT-63 attack-trainer aircraft. In the late 1960 the IA-58 Pucara left the factory, an excellent national support aircraft and light attack that was exported to different countries and now is in the process of modernization. In 1984 was the maiden flight advanced training aircraft FMA IA 63 Pampa, currently still occurs in a modernized version. The neoliberal current, which arrived in the country in the hands of the military dictatorship in the late 1970s, triggered by a decree of Martinez de Hoz, in closing the IME (Mechanical Industries of the State). The Rastrojero stopped making investments to promote foreign automakers and about 3,000 people were out of work. FMA converted into a joint stock company from April 1992, Air Force buying 30 per cent of the shares to establish itself as holding and management authority; control of FMA handed over to Planning Secretary of MoD on 20 December 1993. MoD and Lockheed Aircraft Argentina SA signed concession agreement on 15 December 1994, allocating management of FMA to Lockheed Martin, as Lockheed Martin Aircraft Argentina SA, from 1 July 1995.v This process deepened in the 1990s when the national government gave the company a concession to the US Lockheed Martin, one of the largest global conglomerates dedicated to defense. In 1995, the Argentine government privatized Fabrica Argentina de Aviones SA [Fadea] "Brigadier San Martín", the former Area Material Cordoba, and Lockheed Martin Aircraft Argentina S.A., was formed. Due to the chaotic state of the Area Material Cordoba facilities when acquired by Lockheed, some counted this as a greenfield project. Lockheed invested $230 million in revamping the facilities for aircraft repair. The term of the privatization of the facility was for 25 years with two additional ten-year options. Privatization lasted 15 years and during that period the institutional emphasis, as well as investment and resources generally, prioritized the maintenance category. Lockheed attempted to leverage its international marketing experience to help Argentina export the Pampa. Some countries in other regions also expressed interest in the aircraft but LMAASA was never able to secure the required approvals from the Argentinian government to export the trainer. There was a lot of gridlock in their internal politics. Argentina, given its multiple economic crises over the decades, turned out to be a smaller and less stable market than Lockheed projected. The US manufacturer has also adjusted its international strategy and no longer considers operating production facilities overseas a core capability. The administration of President Cristina Fernandez sought to revive strategic industries such as aviation and nuclear energy where Argentina's advances in those fields during the 20th century were later derailed by political and economic problems. The Fernandez administration reached an agreement with Lockheed Martin to acquire the factory, with the transfer in ownership completed in late 2009. The Defense Ministry now holds 99% of Fadea's shares. Today, Fadea, which employs around 1,000 people [down from a peak of 9,000] and does about ARS400 million ($100 million) in annual sales, survives largely on maintenance contracts with the Air Force. In 2009 the National Government, from a political decision by the government of President Cristina Fernandez de Kirchner, acquired the shares of the US firm Lockheed Martin and Argentina created the new Aircraft Factory "Brig. San Martín "SA. (FAdeA). FAdeA aimed to recover and modernize the aeronautical industry Argentina incorporating technology, generating strategic partners in the region and developing new production processes to meet global standards of excellence. FAdeA is an aviation company with experience in the design and manufacture of military aircraft, specializing in systems of basic and advanced training. In recent years we have enhanced manufacturing capabilities aerostructures for civil market and the military, from a series of investments to upgrade manufacturing technology of sheet-metal, composite materials and structures with wiring, as well as parts and machined parts. FAdeA has the backing provided by the AS9100 certification, a quality standard for the aerospace industry in the world, to offer manufacturing excellence to match the highest international quality standards. Lockheed Martin formally handed LMAASA's keys back to the government in December 2009, after running the facility as a wholly owned subsidiary for 14 years. 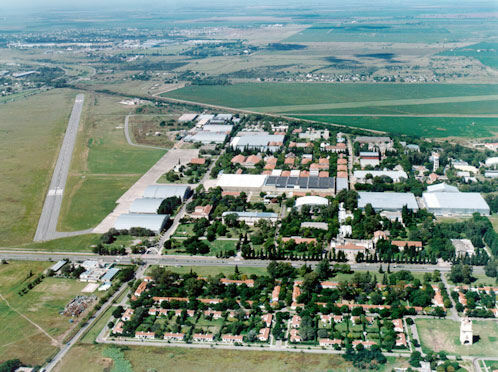 The facility, which was known as FMA for Fabrica Militar de Aviones before the government handed it to Lockheed in 1995 as part of a contract to upgrade Argentina's McDonnell Douglas A4M Skyhawks, Fabrica Argentina de Aviones - is largely the same company with the same capabilities, facilities and 1,100 employees. But it has a new board of directors, executive team and owner. Currently programs are active aircraft manufacturing and Puelche Pampa III, as well as the manufacture of aerostructures for under the Embraer KC-390 project.The company also offers an extensive catalog of products parachute civil and military market, spare parts manufacturing services, Ground Support Equipment and jigs. FAdeA is now a strategic player in the aviation industry in the region, the result of a thorough modernization of its facilities and machinery in combination with its highly skilled human capital. The experience gained by Aircraft Argentina and its new capabilities, such as the modernization of test benches for JT8D testing, provides the company with the ability to offer extensive maintenance, modification and state-of-the-art upgrades for commercial airlines. Aircraft Argentina offers a one-stop-shop with exceptional post-sales service. Aircraft Maintenance, Modification and Upgrade tasks are performed on C-130 Hercules, F-27 and F-28 Fokker, AT-63 Pampa, IA-58 Pucara, A-4AR Fightinghawk, T-34 Mentor and Boeing 737-200 aircraft. Manufacturing capabilities include manufacturing of aircraft, aircraft parts, assemblies, subassemblies, tooling, jigs and composite material parts. Available technologies include: conventional machining, water jet, heat treatment, CNC manufacturing, metal molding Gantry and conventional press, anti-corrosion treatments and painting processes among others. Engine maintenance, engine repair, overhaul and test, components overhaul and repair, service bulletins and modification tasks are performed on the Allison T-56, Atar 09C, Garrett TFE 731, J-52, T-53 and JT-8D engines. Fadea had a government contract to build eight new Pampa airframes. The defense ministers of Argentina and Brazil signed a declaration of intent in October 2010 to move ahead with the KC-390 twin-engine military cargo aircraft. The two countries began talks to establish the terms and conditions of Argentina's participation, through Fadea, in the design and production of the aircraft. Directors of the Argentina aircraft factory (Fadea) announced plans for significant revival of the company, such as a primary trainer to be known as IA-73 whose prototype was to be ready by early 2013. This aircraft would allow pilots to pass training in the mentor to the Pampa IA-63, an advanced trainer aircraft, receiving the modernization of its engine and avionics, to make it competitive in the new global aviation market. The Company was in talks to associate with Boeing to compete with the IA-63 Pampa in a contest organized by the United States Air Force for the acquisition of aircraft for the T-X Advanced Trainer Replacement project.